Abbington Green Bed & Breakfast Inn, Asheville NC: Asheville Bed and Breakfast Gardens Celebrate "the small stuff"
Asheville Bed and Breakfast Gardens Celebrate "the small stuff"
Ok, so we're always associating the best things in life with something like,"Bigger is better" or "Getting to the top", or "King of the hill". All those phrases and many more are all about looking for the best things by looking up...up, not down. Definitely not down. Granted, it's true that lots of things in your garden are truly wonderful if you look "up". We'll talk about "up" another day. But today, today is for "down". 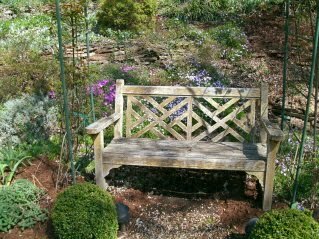 But let me mention two early Spring garden plants that not only are only seen if you look "down", but they also have names that sound really un-important. 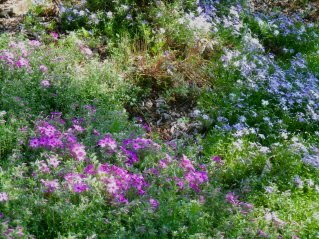 Let's celebrate phlox sublata and vinca minor. Wow, do they sound un-important...one is sub, or under something. And the other is minor...as in, very not-major. The names are a clue that these lovely plants are low-growing, way "down". At this time of year here in Asheville, NC at our bed and breakfast and around town, you'll see phlox sublata spreading to cover the tops of stone walls in sunny, warm places and seeming to drip over the sides. Purple, lavender and pinks are their colors. 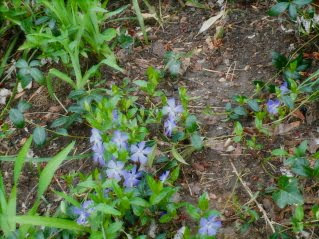 And vinca minor is considered by some people as a weed...it can cover or even 'take over' an area given enough time and enough inattention. 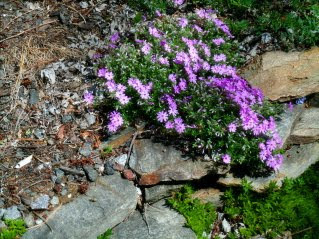 Their jolly little purple flowers pop up bravely from earth that still looks really lifeless from Winter. But you've gotta love these little guys. They're positively fearless! Probably gonna get frozen at night some of their bloom time. Maybe even get snowed on. But do they shrink from their task of brightening the world? Oh, no! They're right out there early every Spring... so if you're at or near this Asheville Bed and Breakfast in the next week or so, please stop by and be sure to look "down" for these diminutive spots of color!